After serving as the Tennessee Hospital Association's (THA) President and Chief Executive Officer for more than 25 years, Craig Becker has announced his retirement. THA's Board of Directors has appointed a committee to conduct a national search over the coming months. Becker will leave his post after a successor is named later this year. "Craig has successfully overseen THA through a remarkable period of growth and change in healthcare, here in Tennessee and across the nation. I and the other members of the Board of Directors want to express our sincere appreciation for his dedication and leadership over the past 25 years. His leadership of THA has been fundamental to the success of Tennessee's hospitals," said C. Wright Pinson, MBA, MD, deputy CEO and chief health system officer of Vanderbilt University Medical Center and THA Board chairman. Becker, who also serves as the chief executive of THA's subsidiaries, THA Solutions Group, Inc., and the Tennessee Hospital and Research Education Foundation, has led the association through remarkable changes since he was named as its leader in August 1993. Becker joined THA just prior to the implementation of TennCare, the state's managed care Medicaid program, which launched in 1994. Since 2008, he has led the charge for patient safety and quality improvement in the state's hospitals, elevating the critical issue to the C-suite in facilities across Tennessee. His time at THA has been marked by many changes in the hospital industry, most recently tackling the health crisis facing rural communities to identify new models that ensure access to providers and healthcare services. Becker and the staff of the THA support nearly 140 member hospitals on a range of issues that include protecting access to healthcare services for all Tennesseans - particularly those in rural and underserved areas, evaluating and adjusting payment reform strategies, addressing healthcare workforce needs, continuing to improve quality outcomes for patients and ensuring the long-term financial health of TennCare and Tennessee's hospitals. In addition to his leadership at THA, Becker recently completed a three-year term on the American Hospital Association's (AHA) Board of Trustees as the only state association executive representative. 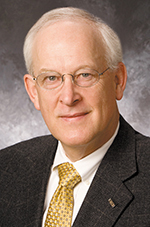 Prior to joining THA, Becker served as president of the Maine Hospital Association from 1989 to 1993. He served as vice president of government relations at the New Jersey Hospital Association from 1985 to 1989.